As much as I don’t like to say it out loud…I must. I actually like autumn. It’s pretty, and it smells delicious! I fight it at first, but when my Pinterest feed starts to fill up with fabulous autumn themed ideas, I give in. There is no use fighting it anymore! So here we are…our first autumn activity! 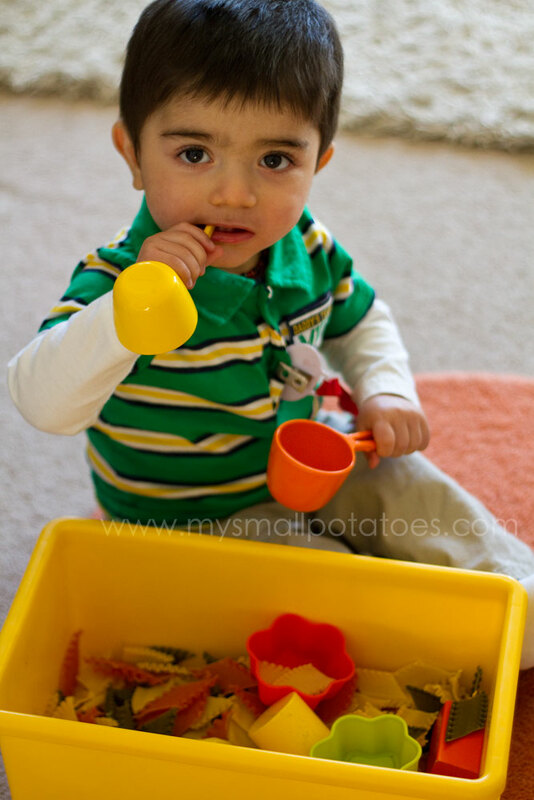 I have 2 little babies in my care this season, so we will be seeing a lot more baby activities here on Small Potatoes. For baby bins, it’s ok to do things on a small scale. In fact, it’s better. Simple is better when it comes to babies. The less little pieces to keep track of, the better. Babies will spread the activity out on the floor around them, so if you feel like cleaning up an epic mess, by all means, go BIG! 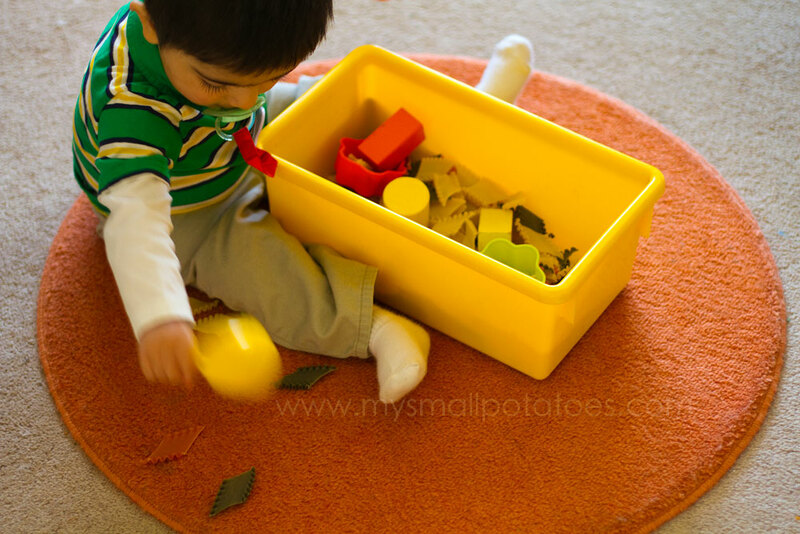 I prefer to keep the mess on a smaller scale, so baby bins are little and simple at my house. I use a smaller bin so it can fit right up close between the baby’s legs. 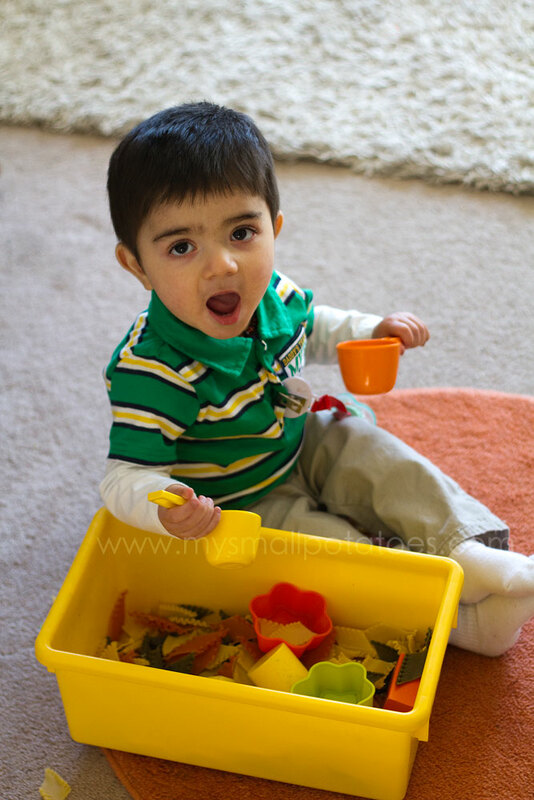 I use materials that I know the babies already love, like scoops, and cups. I like to make it colourful. And I like to make it a bit noisy. Babies love to make a noise. 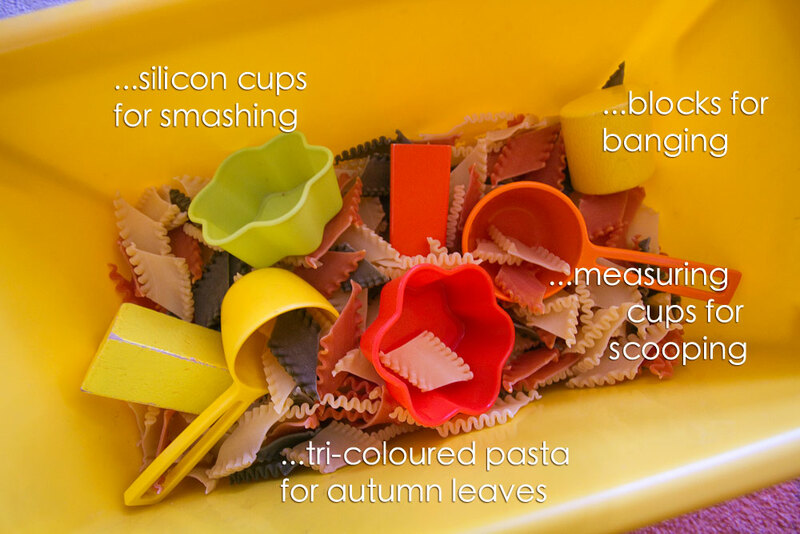 Here is how I made the little autumn bin… Yes, the baby will try to put the pasta in his mouth. I curb this by using the child’s pacifier while they play, or I stay and watch. I let the baby explore the other elements in the bin with his mouth, but when the pasta moves to the mouth, I gently move the hand from the mouth and distract him with something else from the bin. 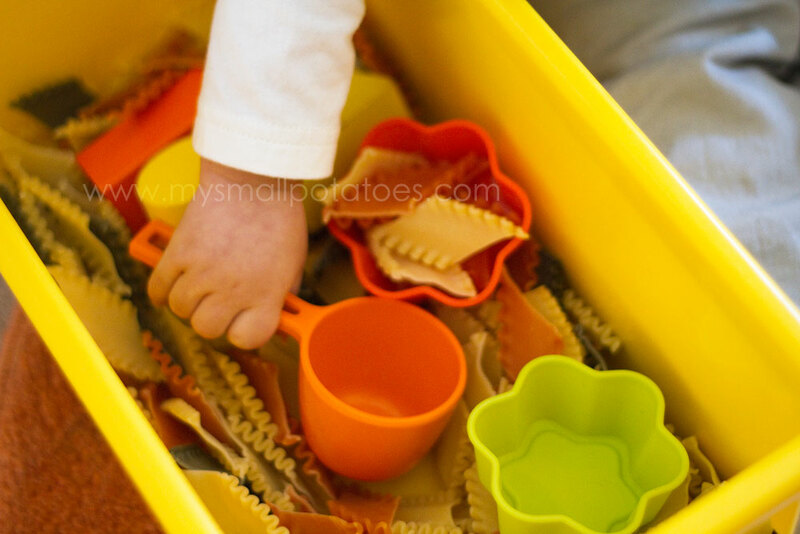 Besides, banging the pasta with the blocks and scoops is way more fun than putting the pasta in his mouth! Baby J spent the next 1/2 an hour digging and scooping and banging in this little bin…happy baby! Now if you know me at all, you know I like to make an activity work for all ages! Well, this one does! Look at these lovely “leaf muffins” this little 5yr old made for me… Happy Fall, everyone! Great idea, Arlee. 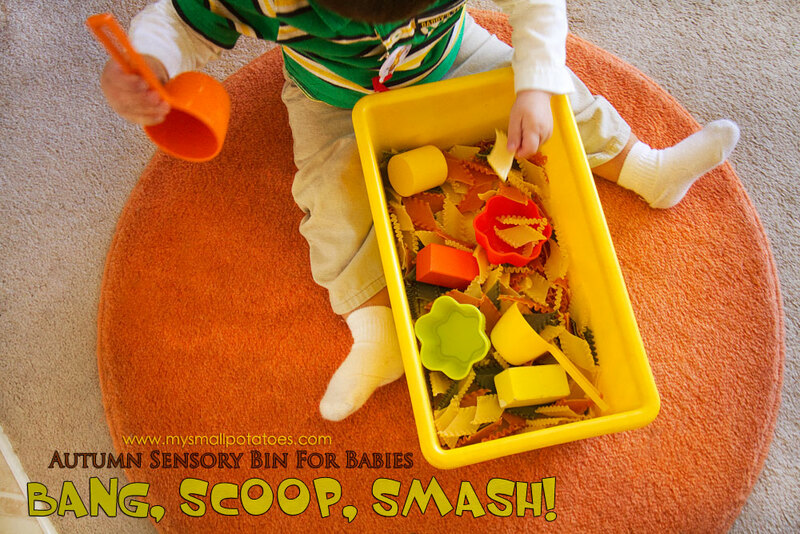 I always concentrate on sensory bins for the older hooligans, but I love the idea of assembling one filled with larger items for the “babies”! 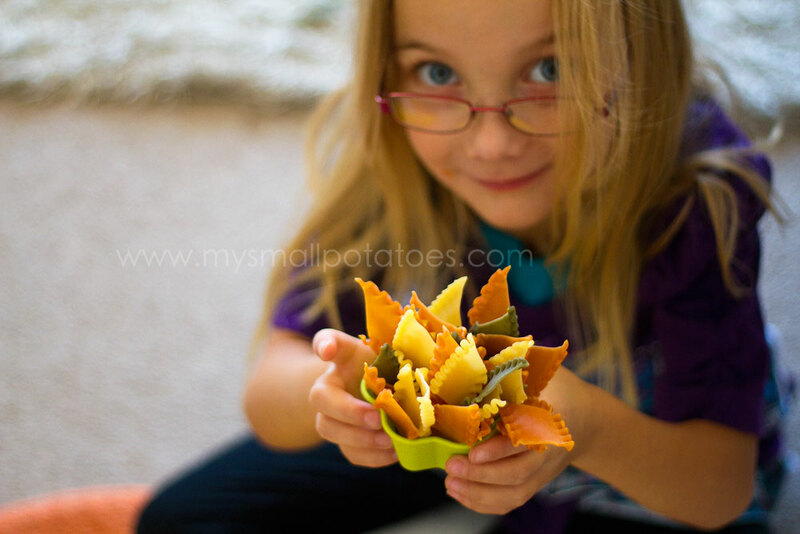 The addition of the fall colored pasta is such a fun idea! Love this & excited for more baby activities!!!! Yay! This is great! I love the colored pasta “leaves”! Great idea! I am working on sensory bins right now. Love the sensory activities. Around what age would you suggest to start sensory activities with babies?